I easily gathered eight cicadas while going about my morning chores on Thursday, and I popped them all into the freezer so they would perish quickly and then be ready for a lunch taste test. You can eat cicadas raw, but I needed all the help I could get to overcome the "I'm eating a bug" factor, so I sauteed them in a bit of vegetable oil, salt, and pepper for about ten minutes until the exoskeletons were pretty crunchy. Then I served the wildcrafted treat up, four cicadas per plate. So, what do cicadas taste like? Actually, when I could ignore the fact that I was eating an insect, they were delicious. Keep in mind that I taste-tested what's known in culinary circles as "soft-shelled cicadas" --- youngsters who have just popped out of their nymphal skins and haven't yet hardened up their exoskeletons. I didn't detect the almond or pistachio flavor reported on the internet. Instead, the texture (and flavor, actually) was like the flesh from the one lobster tail I've tasted, but without that faint hint of fishiness, and with a little crunch when my teeth hit the wings. (I really liked the cicadas wings-on and don't recommend removing the appendages.) Since there are several species of periodic cicadas, I wouldn't be at all surprised if each one tastes a little different. On a scale of 1 to 10, I'd give these sauteed cicadas a 9. In addition to tasting good, the insects also really agreed with me --- as I started writing this post, my mouth watered and I snuck one of the cicadas I'm saving into my mouth for a snack. On the other hand, it probably would have taken all day to gather enough cicadas to serve as the protein source for a whole meal, so I'll just keep snagging the delicacies as I pass them by. Which is all a long way of saying --- I recommend them! If you've got cicadas crawling up out of the ground, now's a perfect time to see if you like them as much as I do. yum. I've also had tasty toasted grasshopper snacks in both Mexico and Spain. The only bugs I have purposely eatten were ants. And that was as a child. They were peppery flavord. Were you looking for a way to deter visitors? Feeding people bugs without their consent is a very bad idea, IMO. I have had "Inago-no-tsukudanii" here in Japan. 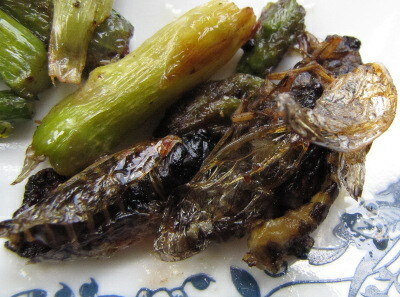 Grasshoppers/immature locust that are boiled in a heavy mirin sauce. We eat it over rice, and it is great if you don't know/remember that it's bug. Crunchy. Joey --- Interesting! Maybe you'll have some cooking advice when you come over to try out our new porch. I'll try to remember to put some in the freezer for us to cook up together. Mona --- I feel like the ants I've eaten were lemony. But I'm not quite sure if that's true or if I'm just remembering the overwhelming scent the one time I caught a bunch of them swarming during a queen's mating flight. Roland --- Don't worry --- I wouldn't slip cicadas to a vegetarian on the sly. I was thinking more along the lines of someone who agreed in theory that they wanted to try bugs, but were scared in practice. A bit like the way my driver's ed teacher got me in the car and, after about fifteen minutes, asked if I wanted to know when my driving test started. When I said yes, he responded that I'd just finished. MamaHomesteader --- I'll bet the cicada is a lot like a cricket, but I could be wrong.... Pretty funny that your husband had to warn you off his pet crickets. Eric --- I was hoping you would chime in! I'd heard that, in Asia, some insects are considered quite tasty. Well, to the best of my knowledge the only insect I've ever eaten was one of those invasive stink bugs . . . and it was quite nasty (as well as being unintentional - it was thirsty and I wasn't paying attention to what might be in my water bottle, heh); I could still taste the stench hours later. However, if I were ever at someone's house and they served me up cooked insects, I would definitely try them; otherwise, how will I know if I like them or not! Sounds like you're the epitome of a good guest. I'm down for trying just about anything, but I think the only way I could eat a bug is if it were breaded, deep-fried, and covered in hot sauce! In addition to about a half dozen other types of peppers, we really want to grow the Ghost Chili/Bhut Jolokia variety! I can't imagine life without Tabasco, lol. I'd vastly prefer eating cicadas to scarily hot peppers. I cringe at the memory -- they were vile. Oh man! How did I miss this! Awesome! 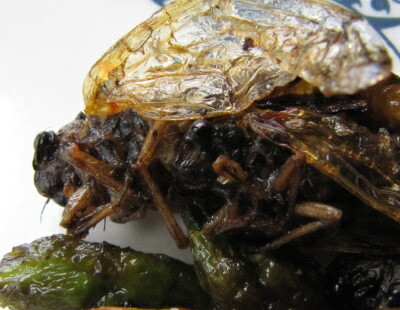 I have always wanted to try a juicy bug of some sort cooked the way I saw on a documentary once. They scoop the bugs (teensy ones, but it would work bigger)and moosh them into patties, like burgers and then grill them up. I think that insect patties with onions and worchestershire, some black pepper and thyme might be very tasty. Very nutritious and a seriously renewable resource! Jen --- I'm glad I ate some of them since it turned out they did a number on my fruit trees when egg-laying time hit. Since the chickens got so many of them, though, I figured we came out even.